Charles Renfro, a principal of Diller Scofidio + Renfro, will use the context of the firm’s work as a means to ruminate on the relationship between nature and its “perversion.” Renfro’s lecture “Unnatural” will use this lens to review recent and current projects such as the turning trees of Arbores Laetae, the pneumatic bulges of the temporary extension to the Hirshhorn Museum, and the zigzagging ramps of the Museum of Image and Sound in Rio de Janeiro and work including the Institute for Contemporary Art in Boston, the High Line, and “Chain City” for the Venice Biennale. Charles Renfro was made a partner at Diller Scofidio + Renfro in 2004 and has been working with the firm since 1997. He served as Project Leader on Brasserie, Eyebeam, the BAM master plan (with Rem Koolhaas/OMA), Blur, and the Boston Institute of Contemporary Art. DS+R has been awarded the AIA Presidents Award, the AIA Medal of Honor, and the National Design Award in Architecture from the Smithsonian Cooper-Hewitt National Design Museum. Renfro’s writings and interviews have been published in journals and books worldwide and he lectures frequently both in the U.S. and abroad. He has taught at Columbia University, Rice University, and Parsons The New School for Design and is on the board of Storefront for Art and Architecture. 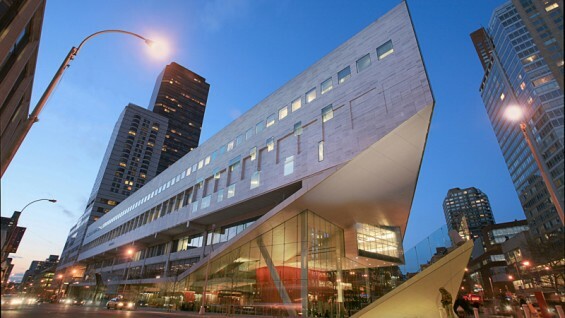 Diller Scofidio + Renfro is an international, 40-person interdisciplinary studio. For three decades, the studio has realized work through a practice that straddles all fields of design (urban, landscape, interior, product, exhibition), media oriented installations, graphics, print, and experimental dance and theater productions. Other major projects include Lincoln Center for the Performing Arts, New York; the Creative Arts Center at Brown University, Providence; the Broad Art Museum in Los Angeles; the Berkeley Art Museum and Pacific Film Archive at the University of California, Berkeley; Media Zone, Abu Dhabi; and Blur, built on Lake Neuchatel for the 2002 Swiss Expo.